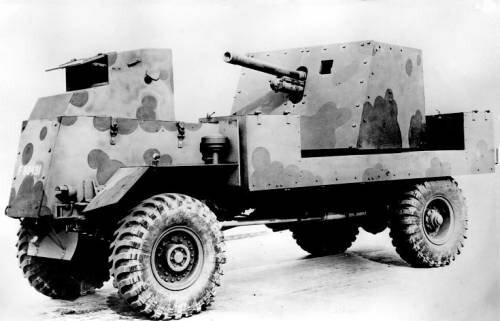 The “Deacon”, called the AEC Mk.I Gun Carrier or “Carrier, 6-Pdr Gun, A.E.C., Mk.I Deacon” by the Royal Ordnance, was an improvised tank destroyer. 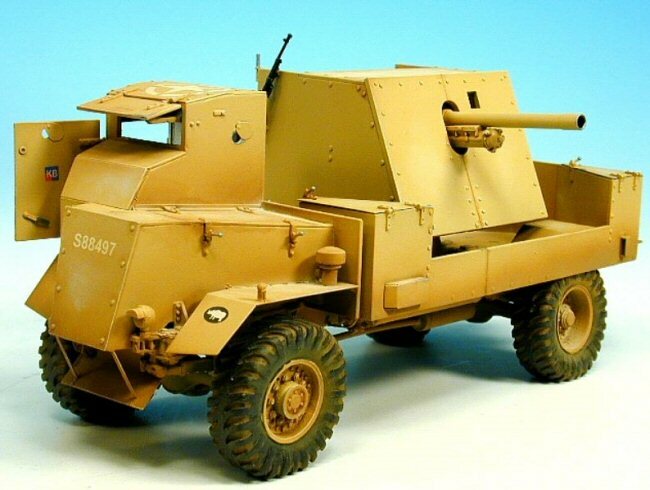 It was born out of the mating of a QF 6 pounder and an AEC Matador truck chassis. The incentive was to provide British Army units operating in North Africa with a mobile anti-tank weapon in 1942. 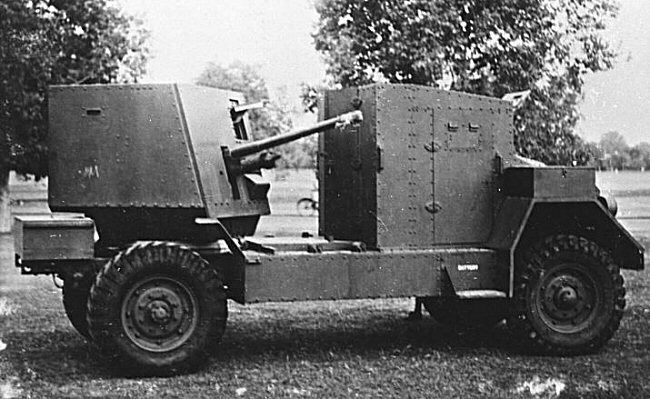 The generic concept was to use an artillery “en portee” system, with the gun place on the truck’s back, protected by a shield. A rear view of an early predecessor of the Deacon. 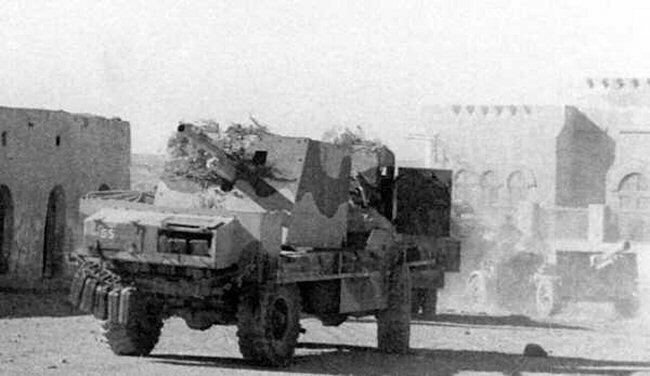 This improvised en portee vehicle carries the original 6 Pdr with all the gun carriage including the wheels, protected by side armoured walls. 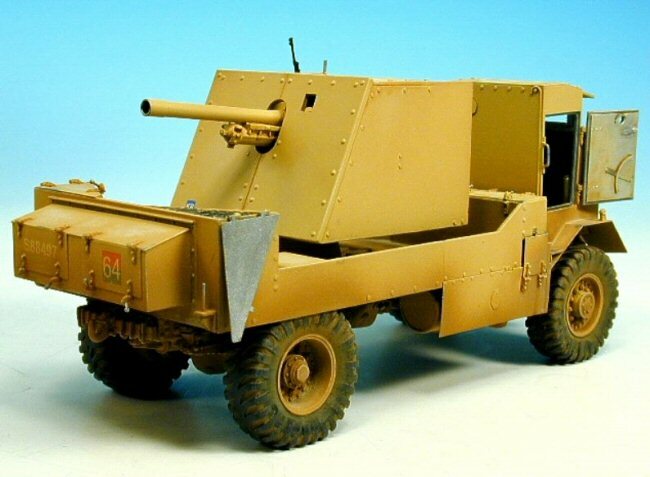 The early version consisted of the towed version of the 6 pdr gun being placed on the back of a flat backed Matador lorry and surrounded with protective armour plate. The original gun carriage and its wheels were kept on the gun. On later versions the carriage and wheels were dispensed with and the gun was fixed to a bespoke mount that enabled the gun to swivel better. 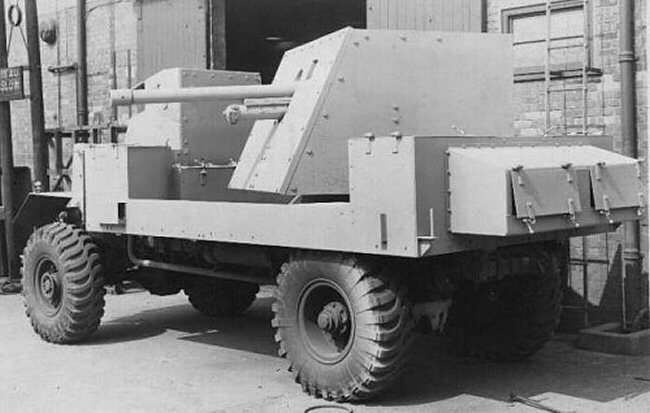 The “Deacon” was just another ecclesiastic denself-propelled for self propelled guns, on par with the Priest (M7), Bishop (British 25 pdr SPG) and Sexton (Canadian 25pdr SPG). The driving compartment was completely armored. In order to minimize the weight of the vehicle in spite of all of the added armor, the Matador chassis was spoiled of everything unnecessary. The cab for example was reduced to the bare minimum, next to the engine hood. 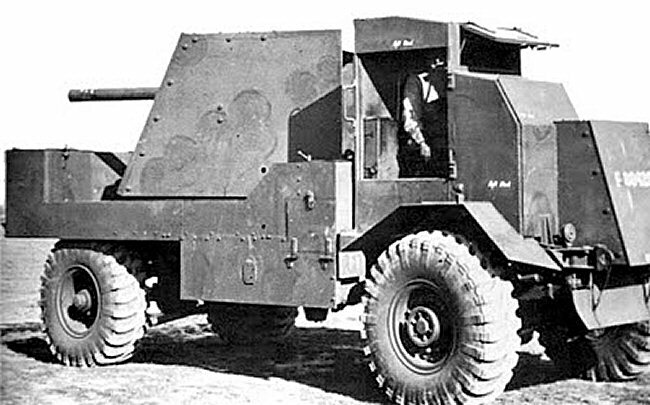 The engine was an AEC A173 6-cyl diesel providing 95 hp (71 kW). It had a 7.8 hp/tonne power to weight ratio for its 12 tonnes. This gave it an average speed of 19 mph (30 km/h) and a range about 280 km (175 mi) at cruise speed. 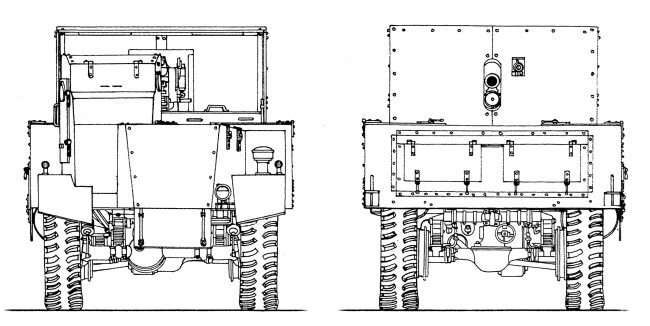 Due to the nature of the desert terrain, it’s 4×4 configuration was not at a mobility disadvantage compared to tracked vehicles. The armor was substantial for such a vehicle, protecting against small arms fire. The maximum thickness was at the front, with 20 mm (0.79 in). The large open cargo bay held the storage bins for ammo in the corners, plus additional bins on the back. In the center of it layed the ROQF 6-pdr gun (57 mm/2.24 in), which was the standard antitank gun of the British Army. The weapon was protected by a large custom shield that offered much better overall protection for the gunner and loader than the regular shield. The vertical sliding block breech still had plenty of room to recoil. In addition, the mounting was modified out of an AA model, which allowed for some extra elevation. This permitted the gun to be used in a supporting rôle. 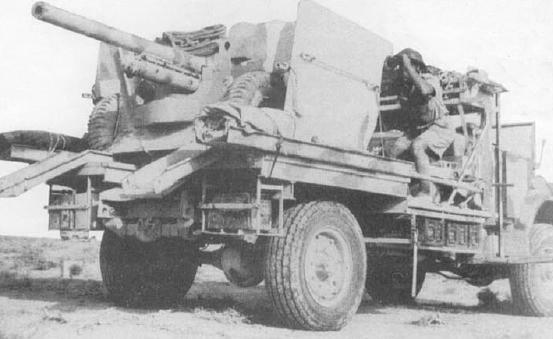 The cargo bay arrangement and the reduced driver compartment allowed the gun 300°+ degrees of unobstructed traverse. The 6 pounder QF (Quick Firing) was a 2.24 in/57 mm caliber gun. It fired 57×441 mm rounds up to an optimal direct line of sight range of 1,650 yds (1,510 m). When firing indirectly, on a parabolic trajectory, it had a maximum range of 5,000 yds (4,600 m). The weight of the barrel and breech was 2,520 lbs (1,140 kg). Depending on the model, the barrel length ranged from 43 to 50 calibers. The muzzle velocity was around 855 m/s (2805 ft/s) with the AP and APC ammunition available in 1942. By 1943, an APCBC shell was introduced (800 m/sec) and an APDS (1150 m/sec) one in 1944. It seems that, when the Deacon was introduced, only L43 caliber 6 Pounder guns were available. These were capable of penetrating 94 mm (3.7 in) of armor at 100 m. They were, therefore, more than capable of dealing with any German tank deployed in North Africa at that stage in the war. Apart from this gun, there was no secondary armament. The crew had to rely on their personal weapons to deal with any enemy infantrymen that got too close. The Deacon was produced in a short timespan, from December 1942 to January 1943. Only 175 were ever manufactured/converted. They played a significant role during the action at El Hamma, with the 76th Anti-Tank Regiment, securing a clear-cut victory over a mixed German Force including Panzer IIIs. Some survived to the Tunisian campaign, but their part in the war was considered over. 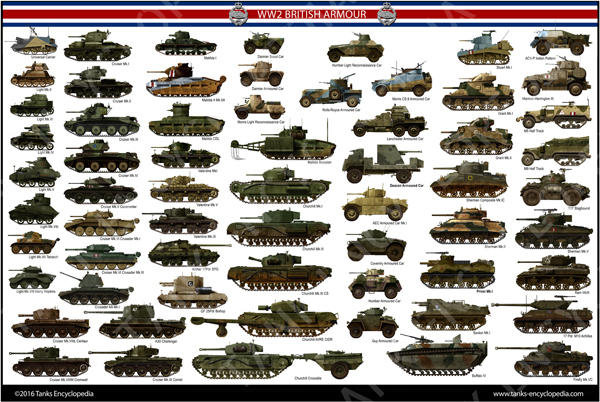 New US-built tank destroyers and more capable British tanks were now being built. Plus, the Deacons were not suitable for the muddy battlefields and cluttered skies of Northern Europe. Many were converted back to supply carriers or passed onto Turkey before the end of 1943. An AEC Mk.I Gun Carrier Deacon with an early green camouflaged livery, December 1942. Standard AEC Mk.I Gun Carrier Deacon in desert livery, 1943. Seems that the “about the gun” section has the same final paragraph twice, just a heads up.